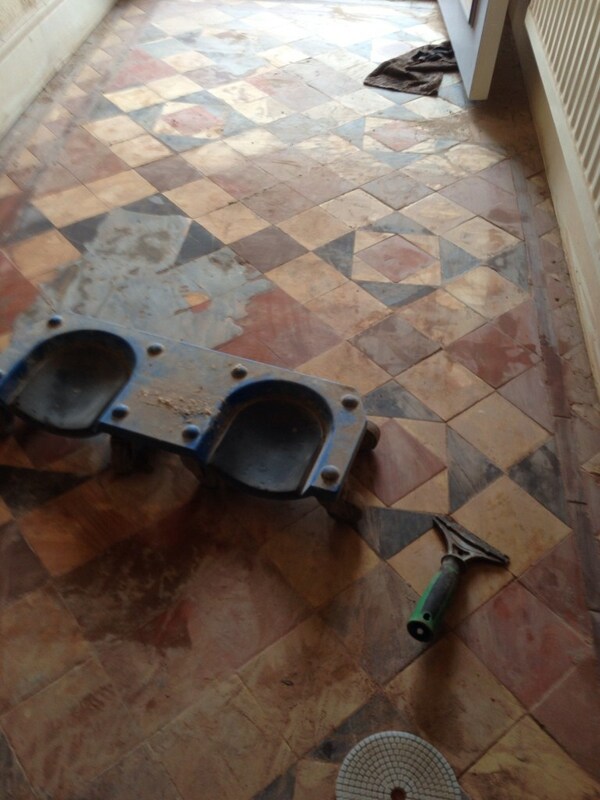 I made another visit back to the historic and famous town of Stratford-upon-Avon recently this time to restore a Victorian Tiled Hallway which had been covered In self levelling cement (don’t ask) which was proving very difficult to remove and I doubt William Shakespeare would of approved. 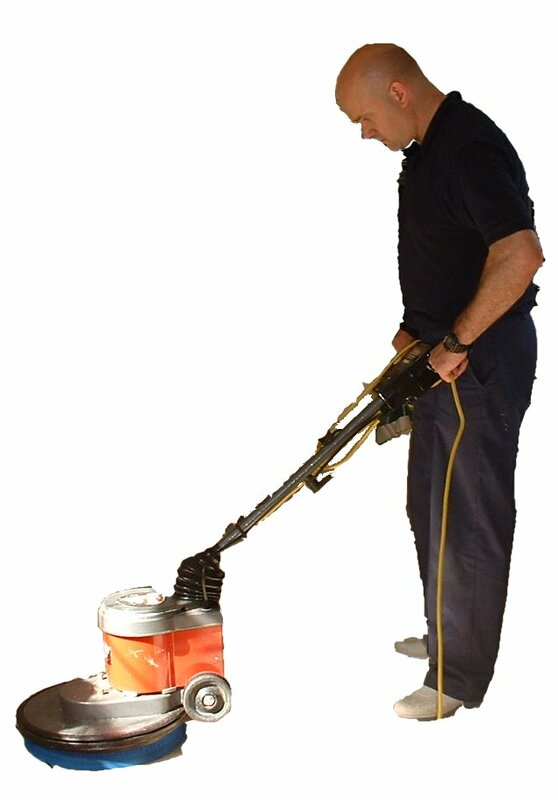 None of the usual methods for removing cement from tile was proving to be effective against this stuff, it was simply too thick so it was necessary to resort to a set off milling disks which grind the surface, I could only go so close to the tile with these however and had to resort to a hand scrapper to remove much of the rest and as you can imagine this took a long time to complete and was quite exhausting work. 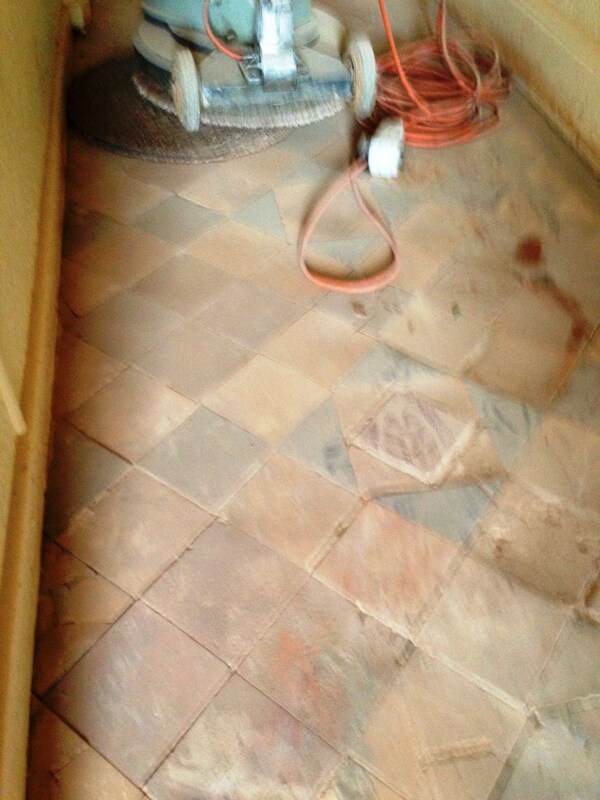 The resultant powder was swept and vacuumed from the tile before applying Tile Doctor Grout Clean-Up which we normally use for removing grout smears, it’s an acidic product that you allow to dwell on the tile for a few minutes and then agitate with a scrubbing pad and then remove shortly afterwards using a wet vacuum and then quickly washing the floor down quickly to ensure the acid is removed. 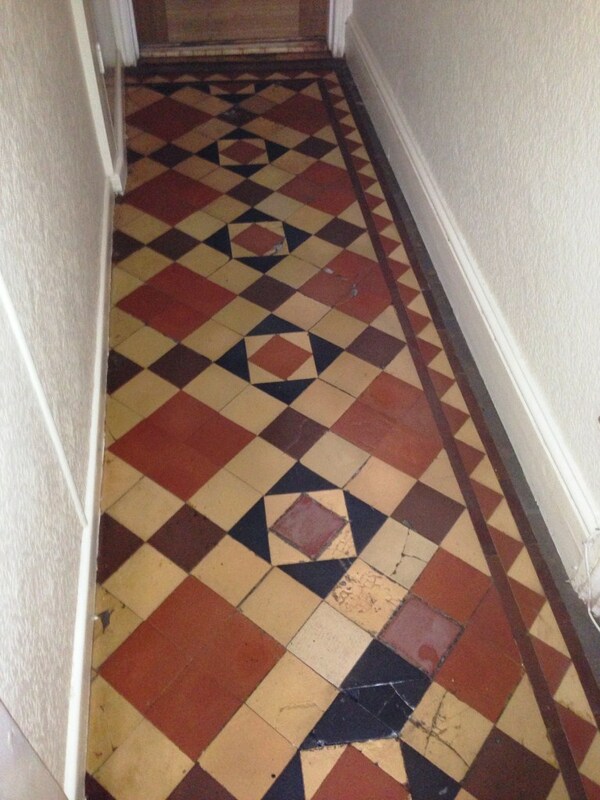 The next job was to give the floor a deep clean using Tile Doctor Pro-Clean mixed 50/50 with NanoTech UltraClean which was worked into the pores of the Victorian tile and grout using a slow speed rotary machine fitted with a scrubbing pad. 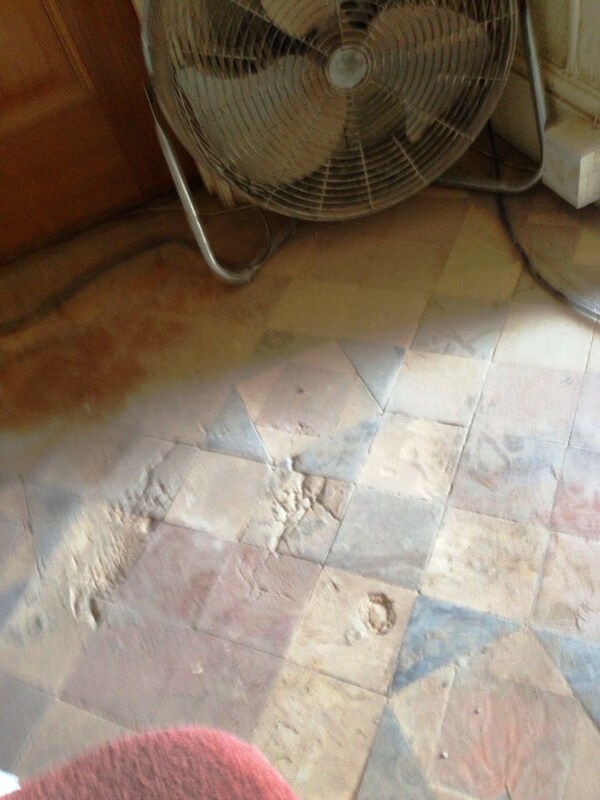 The dirty solution was removed and the floor rinsed thoroughly with water, again we used the wet vacuum to remove the water and get the tile as dry as possible. I left the floor overnight to dry overnight leaving an air blower to accelerate the drying time and then came back next day to seal the floor; I used a damp test meter first to verify the floor was dry and ready for sealing. 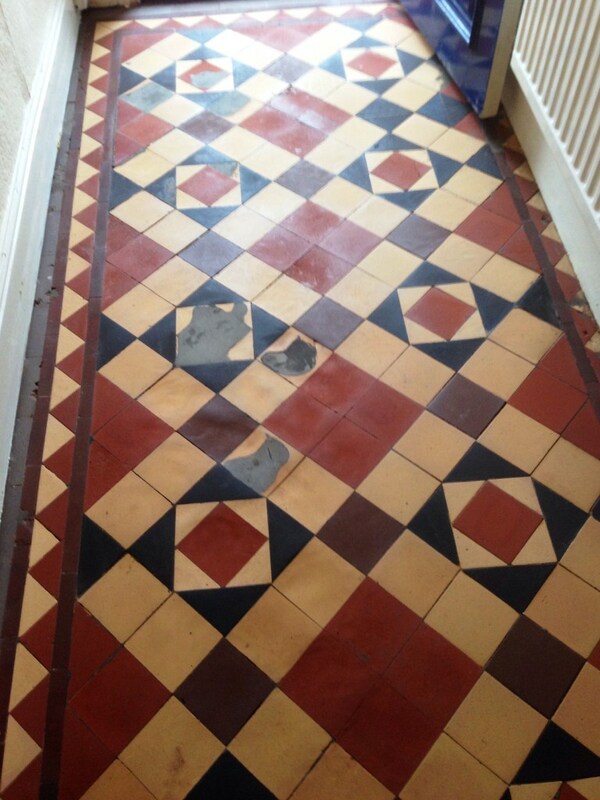 Once happy I proceed to apply four coats of Tile Doctor Seal and Go which is an ideal sealer for Victorian Tiles as it leaves a nice shine on the floor as well as providing great stain protection. It was an exhausting job and quite a transformation, unfortunately there were a few area’s I could do nothing about but it all adds to the character of the floor.